The southern 12 km of Sandy Hook is lined with a massive seawall that eventually terminates within the Park. Because of a negative sediment budget and the impacts of the seawall, the area immediately to the north of the end of the seawall (Critical Zone) has had a history of erosion. As Gunnison Beach, north of Critical Zone, gains sediment a unique project has been created to balance the sediment budget. A pipeline has been constructed from Gunnison Beach to Critical Zone with the intent to pump a sand slurry updrift and move sediment from the site of accumulation to the site of erosion. 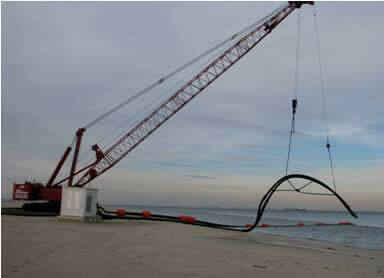 The pipeline is scheduled to test the first sediment transfer this November, 2011. 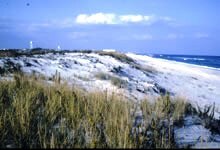 There is the potential for the feeding zones of the piping plover habitat (which lies inbetween the two recreational beaches) to be affected by the sediment transfer. We have been collecting diversity and abundance macrofauna data to determine the magnitude of the possible impacts of the sediment manipulation and beach changes on plover feeding habitat. Psuty, N.P., B. Shafer, and T.M. Silveira, May 2010. 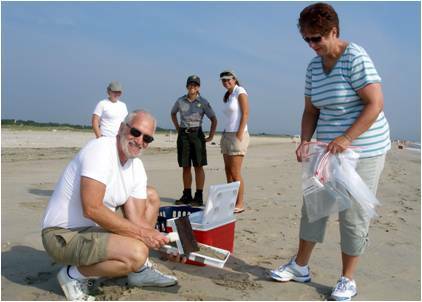 Baseline Data on Macrofaunal Diversity and Abundance in the Beach Face, Critical Zone and Gunnison Beach, Sandy Hook Unit, GNRA, 2008-2009. Phase I: Prior to Operation of the Slurry Pipeline. 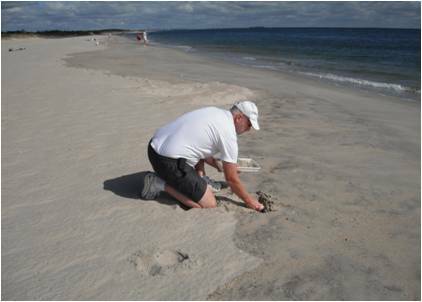 Submitted to David Avrin, Chief, Division of Natural and Cultural Resources, Gateway National Recreation Area, NPS, 32 p.
Barry Shafer collecting sand (and macrofauna inhabitants) from the swash line. Barry and Chris Shafer place samples into cooler to sift back in the lab.